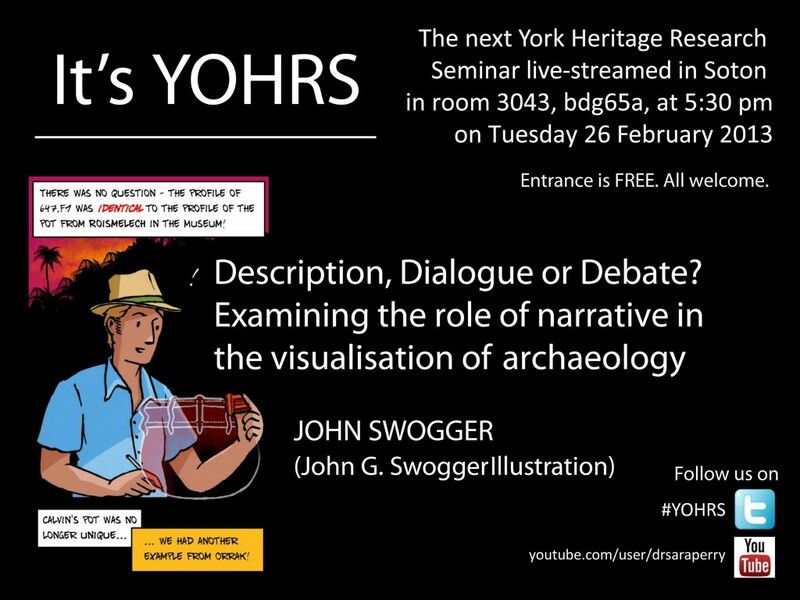 Tuesday 26 February we will be live-streaming another York Heritage Seminar, this time by the archaeological illustrator John Swogger who will talk about “Description, Dialogue or Debate? Examining the role of narrative in the visualisation of archaeology”. The seminar will take place at 5:30pm in room 3043 (archaeological computing lab) building 65A (Avenue Campus), and you will be able to ask questions to the speaker. Archaeological visualisation tends to rely on “snapshot” images depicting single events or phenomena, but even these images contain implicit narrative elements. How might explicitly narrative images be used to create opportunities for multi-layered description, a forum of visual dialogue, or a focus for debating alternative readings of archaeological practice or interpretations of the past? John Swogger is an archaeological illustrator who works with audiences and archaeological sites from around the world. Recently he has contributed to the visualisation of sites in the Caribbean, Palau and Turkey. I am currently a postdoctoral researcher at the Department of Computer and Information Science, University of Konstanz. I received my PhD in Archaeology from the University of Southampton (2014) for my work entitled ‘Evaluating network science in archaeology. A Roman archaeology perspective’; I also gained my MSc from Southampton, in ‘Archaeological Computing: Spatial Technologies’, where I was a member of the Archaeological Computing Research Group. I hold an MA and BA in Archaeology from the University of Leuven. Together with Anna Collar and Fiona Coward, I am a founding member of The Connected Past, a multi-disciplinary research group that aims to provide discussion platforms for the development of original and critical applications of network and complexity approaches to archaeology and history. I am secretary of the internationalComputer Applications and Quantitative Methods in Archaeology conference (CAA).